Put on this scarf and hit the street in style. With a quality make, the scarf offers great protection from cold weather. 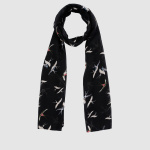 Sporting a bird print on a contrasting background, this scarf looks striking and gives your outfit a modish uplift.